The actual plot is basically irrelevant, so I won't spend very much time even mentioning it. The movie is based on the idea is that there is a cartoon world and a real world. We don't find out why until the very end, but there's a lot of hubbub about keeping the two world separate, mostly from Brad Pitt's character Detective Frank Harris, making him essentially the Jim Crow of Toontown. There appears to be a fair amount of visual and narrative metaphor, but the movie gives me little reason to investigate or delve into it at all because of how vapid and unlikable the characters are. Why this movie is worth talking about is because I found it not only to be offensively simply minded (this is speaking to the fact that it's poorly written, not that there's an awful lot of lewdness to it [that's totally fine with me]), but because of what it represents. At first it appears to be a heavy handed attempt at a "response" for a more "adult" version of Who Framed Roger Rabbit, made even more evident with the initial 1945 setting, the imitation Jessica Rabbit (and imitation "fake" Jessica Rabbit), and main character toons just plainly looking like WFRR rip-offs. But I don't think that's exactly why this movie is such a disgrace. There's a scene early in the movie where Gabriel Byrne's character, Jack Deebs, goes into a comic store, where he is instantly recognized as the underground comic star that he is. To accentuate the fact that he's underground, when he's mobbed by the die-hards, one guy takes the opportunity to get his comic signed by who he assumes is someone famous, then asks who Jack is. And it hits me. This is not an "adult" version, it's ripping off Underground Comix (I know, I know, it should have hit me sooner, but I was hardly paying attention at any moment in this movie so give me a break ;) ). From the expressive art style to the over sexualized content, it screamed Comix. The creative hand behind Fritz the Cat at the helm and small references to other Comix tropes didn't hurt (I think I even saw a Trashman shout out) ... but again and again it kept feeling watered down and wimpy. Comix don't pull any punches, they lay it out for the world to see, which is why they're interesting, and why the idea of doing a Comix version of WFRR would, conceivably, be a really awesome idea. But instead we have this weak, impotent attempt at making the audience feel "naughty." The reason for this? I'm going to make a few leaps here, but hear me out. 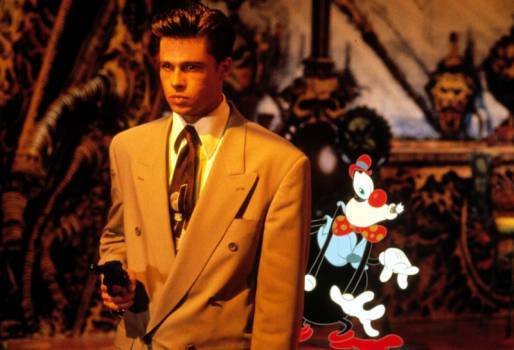 Cool World was made by a company that produced Friday the 13th, Charmed, and every Star Trek series. As much as people love those things, F13 was created because of Halloween's success, Charmed because of Buffy's, and Star Trek because of ... okay well because of the unexpectedly popular Star Trek the Original Series, but come on, you know where I'm going with this. Paramount, people, Paramount Pictures. For years they've been taking recently unearthed underground hits and turning them around for a quick buck for years. This movie should come as no surprise. Now I'm not going to say that everything that Paramount puts their stamp on isn't creative and awesome on their own, or that they don't eventually become their own thing, but there are a few suspect items on their list that make my eyebrows raise. And this indiscretion seems like a step too far. They have de-sexed the sexiest, dirtiest things out there, and made it something 8 year olds feel cool for watching, and adults feel embarrassed for even knowing about. What a travesty. I'm done talking about this. That's all. Side note: I hate this movie, and, because of this, I made some bold statements, and didn't really reinforce them. I also didn't edit this very well. Forgive me. Also, the animation reminded me of the animation style from Kings Quest VII, another creation of the early 90's that was derided for it's poor quality animation.